Despite the accompanying spring showers, the 40th Anniversary Exhibit Train’s first stop after National Train Day proved popular. and Exhibit Train from above. 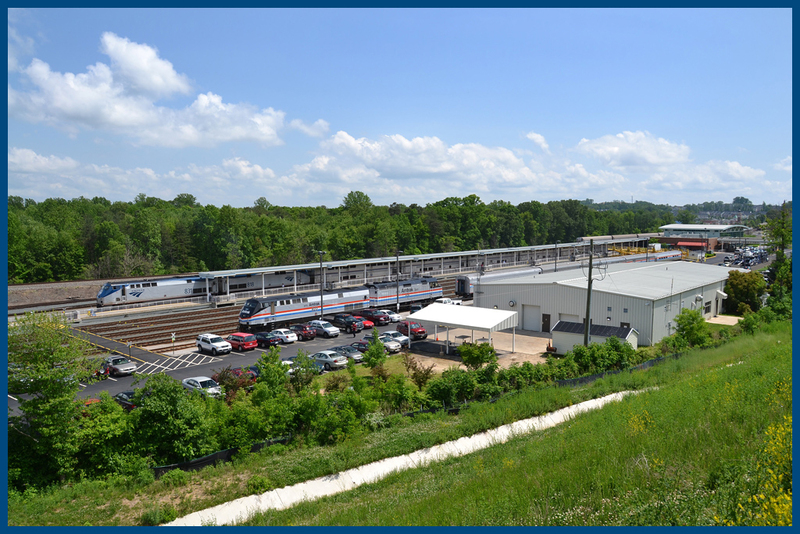 Lorton is a pretty unique station, as it is the northern terminal for the Auto Train, the only train in North America to simultaneously carry passengers and their motor vehicles. 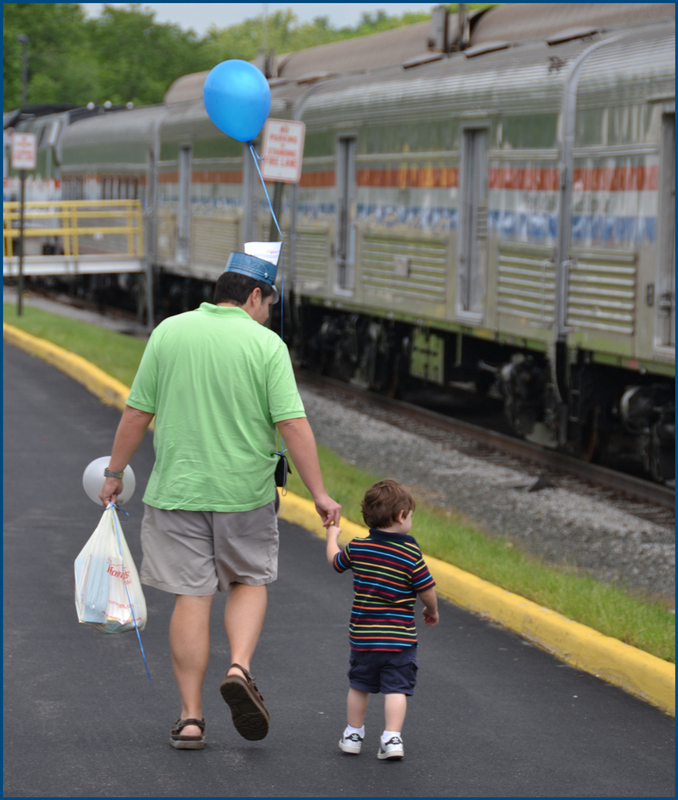 The Auto Train runs daily between Lorton, a suburb of Washington, D.C., and Sanford, Florida, located amid that state’s popular theme parks and attractions. When the clouds broke for a few minutes and the sun briefly shone, we clambered up the hill overlooking the rail yard to get some panoramic shots of the Exhibit Train with the Auto Train and the station in the background. The Exhibit Train’s engines looked pretty stellar from a distance, as their bold retro paint scheme really stands out against the vivid greens of the trees and the soft blue skies. Getting down the slippery hill, that’s another story…. Father and son at Lorton Passengers on the Auto Train have to arrive a few hours early in order for their motor vehicles to be loaded onto specially built rail cars. While waiting for the day’s departure, many people strolled over to take a look at the Exhibit Train and its three cars that hold 40 years worth of Amtrak memorabilia including colorful advertisements and model trains. The Auto Train has a loyal customer base, and as I watched the passengers wander through the exhibits, I wondered how many of them remembered some of the items that were now behind glass. One of the first things that passengers encounter when they step on the train is a female mannequin dressed in a uniform that was worn by on-board staff in the early 1970s—in fact, this uniform has been lent to the Exhibit Train by a former employee who kept it safe and sound for many years. The outfit was designed to feature Amtrak’s corporate colors of red, white, and blue—all in very bright hues that are hard to miss. The red top features Amtrak’s original “inverted arrow” logo as a decorative element on the collar and the center placket (the area down the middle with the buttons). Everyone seems to want a picture with our friendly host, and she definitely stays in good humor although everyone jokes about her “stiff” personality! 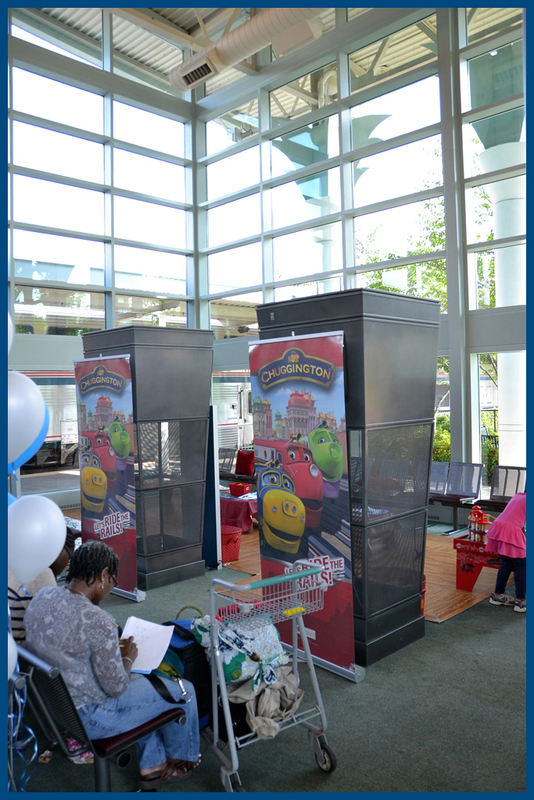 Chuggington Depot at Lorton Inside the Lorton Terminal, kids had fun playing in the Chuggington Kids’ Depot where they helped color a “traintastic” birthday card for Amtrak, had their photo taken with Koko, Brewster, and Wilson, and received paper conductor hats (and yes, I saw a few Moms and Dads with hats too…). After playing with the toy trains, the kids really got excited to see and walk through the real thing. Some of the little kids were barely taller than the locomotive’s wheels, so I’m sure those machines were impressive. Although we had fun in Lorton, the railroad never stops. This week, we’re heading north where we’ll cross the Potomac River, pass the Jefferson Memorial, and enter into the cradle of American railroading: Baltimore (or as the locals say, “Bawlmer”). Hope to see you on Saturday or Sunday in Charm City!